Another one of these places that we haven't been to in a while. I must say that it bears all the hallmarks of the worst of 90's restaurant design - tiny tables packed as closely together as possible. When the restaurant is full, the only way through the restaurant is sideways! It really makes me appreciate places such as Fenix that give the patrons decent sized tables, that are generously spaced from their neighbours. It helps to create the dining experience rather than make you feel as if you're in some kind of feed lot. 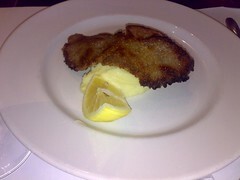 Veal Coteletta with mashed potato - this is off the fixed price lunch menu. It's quite small and I believe the veal lied about it's age. It's looks like it's made in-house and is cooked to order. The mashed potatoes are quite smooth and overall it's alright. 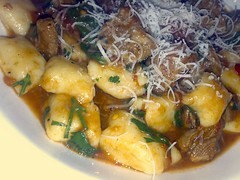 Paalo opts for the Gnocchi con Agnello ($25.50) from the regular menu and he gets a more generously sized portion. 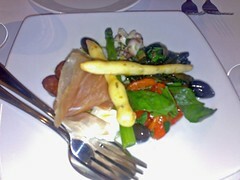 The gnocchi are a touch on the large size but taste of potato. It's served with a lamb ragu. The parmesan is grated to order at the table. It's another nice dish. 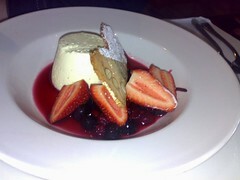 Panna cotta with berry comport ($14) - it's tasty, there's nothing extraordinary about it. 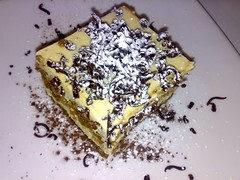 Tiramisu ($13) - a decent serving - not too soggy, another good interpretation of a classic dish. At Italy 1 it's all about not changing. You don't get anything cutting edge but what you do get is well made and fairly mainstream. I think the adjective we most used during lunch was "nice". The gentile folks of Camberwell won't have their senses disturbed by eating out here.